Jerald James has always enjoyed coming to the aid of others, so helping his fellow Detroit EMS co-workers resolve employment concerns was a natural transition for him. Now that he’s recently retired, James is taking his next step helping others as the newest MAP Labor Relations Specialist. James represented EMS workers for nearly two decades through his various positions at Detroit EMS, including EMS Superintendent and his most recent position as EMS Captain. He begins his new career with MAP in September. James was a Michigan Association of Fire Fighters (MAFF) Union Steward since 2014, when EMS Supervisors joined MAFF. Now MAFF representatives are hoping EMTs and Paramedics will join the union as well. “I was actually the union president for the group when we affiliated with MAFF,” James said. “To me, it was a natural transition. I really liked what I’m doing - I wouldn’t change it. I think this is a nice group of guys I’m dealing with too,” he said of the Labor Relations Specialists. MAP’s staff of labor relations professionals has earned recognition throughout the state for their unequaled record of success in all phases of union representation. Expertise reflects not only longevity, performing many years of highly specialized union business, but steady growth and adaptation in this increasingly complex field of knowledge. To be an effective and respected representative of public safety/public employee personnel, each MAP Labor Relations Specialist has accumulated many years of experience in all aspects of representation and has superb credentials. Their inside knowledge of Michigan’s labor relations community began when they served as public safety officers who represented their peers at the bargaining table. Two “breakthrough” contracts in Sterling Heights showcase their achievements: an agreement which for the first time brought base wages of over $70,000 a year to officers in Michigan, and the pact years previous which smashed the $30,000 a year barrier in the state. Thorough understanding of the issues and how they impact union members is critical when it comes to having a representative who will fight for the rights of others. MAP Labor Relations Specialists not only have the background to address tough issues while focusing on specific concerns of members, they have the foresight necessary to bring both sides of table together. This unique combination of attributes can be seen in the achievements made in MAP bargaining agreements throughout the years, paying dividends to the hundreds of members who wisely invested their futures in the Michigan Association of Police. Union Executive Directors are expected to oversee their labor staff and day-to-day operations, but Executive Director Fred Timpner leads MAP Labor Relations Specialists by example, taking a seat at the bargaining table as well. The former President of Southfield Police Officers’ Association (SPOA) personally negotiates contracts, keeping himself fully immersed in the continually changing labor relations field. Within a year of joining Southfield PD in 1971, he was selected as Shift Steward for his local association. Soon afterward, he was elected Vice President and then President of the 100-member group. Timpner has more than three decades of law enforcement labor leader experience, earning a reputation as an expert in contract negotiations, grievances and grievance arbitrations. He has a full complement of labor relations studies including: a bachelor’s degree in Social Science from Michigan State University; master’s degree in Criminal Justice from University of Detroit; graduated Michigan Law Enforcement Officers Training Council (now known as MCOLES); and numerous certifications from various labor relations courses and training. An established professional experienced in presenting Act 312 arbitration cases, he served as an adjunct professor at Lawrence Technology University, instructing courses in labor relations and dispute resolution for three years. In his spare time, the married father of two daughters enjoys playing golf, reading, and spending time with his four grandchildren. Rich Heins spent 23 of his nearly 30-year career with Sterling Heights Police Department as the local Union President for MAP. He retired from Sterling Heights PD in March 2019. He was voted MAP Executive Board Vice President in December 2010 and served in that role until being elected President from December 2012 to December 2018. In 2016, Heins was sworn in to Michigan Commission on Law Enforcement Standards (MCOLES), representing MAP. He took over the remainder of Executive Director Fred Timpner’s two-year term and continues to serve on MCOLES in MAP’s permanent board seat. Heins was integral in starting the K9 program at Sterling Heights PD in 1995, serving as their first K9 Officer. He worked as Assistant K9 Trainer at Oakland Community College and Head K9 Trainer at Macomb Community College from 2008-2014. The divorced father of two sons operates his own business, Skooby Do’s and Don’ts K9 Training at Heins Field in Sterling Heights. Heins Field, the training field at Baumgartner Park, was named in honor of Heins in 2018 for his longtime work with police K9s. He has a bachelor’s degree in Criminology and Juvenile Delinquency from Valparaiso University. Jerald James has represented EMS workers for nearly two decades. His union career track began in 1997 as Union Steward with International Union of Operating Engineers (IUOE). He climbed the ranks to Chief Steward from 1998-2002 and President from 2002-05. In 2005, he was promoted to Lieutenant, and in 2007 became President of EMS Officers Association. He was promoted to EMS Superintendent in 2010, the highest position in the organization, and stayed until 2014 when he left the job to become a Captain and President of EMS Officers Association again, this time a unit of MAFF. James made history, leading the way to the largest settlement with the City in Detroit EMS history. When 21 Detroit EMS workers, who were certified as Paramedics, were not being paid the rate negotiated in the contract, the union filed for arbitration and James was part of the team who found the documentation needed to prove the rate should be paid. James took on part-time positions as a patient care attendant at Grace Hospital’s psychiatric unit and with the substance abuse detox unit at Salvation Army while working his full-time EMS position. He graduated from Eastern Michigan University Fire Staff and Command Academy. The married father of four enjoys refereeing high school, college and semi pro football games when he is not busy serving MAP members. Joe O’Connor has a wealth of union experience, both on the job, as a retired Sterling Heights Police Sergeant, and in his personal life, growing up the son of a United Auto Workers Committeeman. He served 31 years with Sterling Heights PD, 17 of which he was a dues-paying MAP member. But his union experience really began at age 10, when O'Connor started attending UAW meetings with his father. This influence provided him with a solid background using a diplomatic approach to resolve issues. As Grievance Committee Chairman for Sterling Heights Police Officers Association, O’Connor's goal was to resolve issues at the lowest level possible. As a member of the contract negotiation team for the Police Officers Association, he was instrumental in settling multi-year contracts. But make no mistake; O'Connor is not afraid to take a hard-line stance when necessary. When he is not busy representing MAP members in contract negotiations and disciplinary matters, the married father of four with four grandchildren enjoys spending time with friends and family cruising Lake St. Clair aboard his boat. O'Connor and his wife, Cheryl, were into motorcycling, however, he said, he had to get back into boating since he couldn’t fit everyone on the motorcycle. James Steffes was a local union official with Sterling Heights Police Department when he became part of the team breaking statewide barriers in wage and benefit packages with the help of MAP’s Executive Director Fred Timpner. 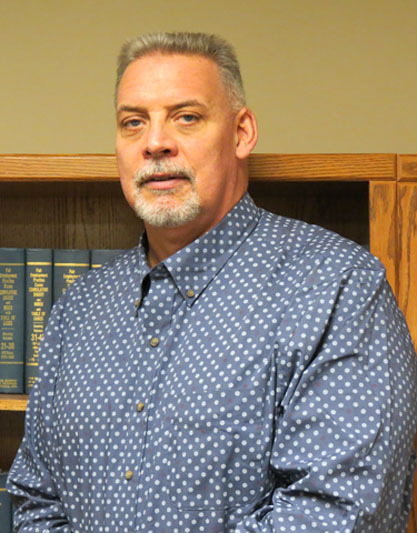 After 26 years on the job, Steffes retired as a Police Sergeant and joined MAP as a Labor Relations Specialist to continue providing high quality representation to law enforcement employees. While serving as a Patrolman, he was active with the Grievance Committee for eight years and involved in union activities. The time spent helping fellow employees resolve their concerns with management made a lasting impression on Steffes. He found his personality and disposition were a perfect fit for successfully handling difficult contract situations for MAP. In his free time, the married father of one enjoys golfing. Ed Wertz accumulated two decades of labor experience serving on the Detroit Police Officers Association (DPOA) Executive Board, chairing their Finance Committee and Bylaws Committee, and serving on the Election Committee. The retired Detroit Police Officer served 32 years with the department, 28 of which with the prestigious Mounted Police Section. He personally handled over 100 grievances and was instrumental in providing goals and direction for the membership during collective bargaining. Wertz served as Vice President and President of Retired Detroit Police and Firefighter Association and was a board member of Police Benefit and Protective Association, also affiliated with Detroit Police. He volunteered as a member of Detroit Police Athletic League and remains active as a Knights of Columbus member. Wertz earned a degree in Criminal Justice from Henry Ford Community College. He takes his responsibilities to the membership seriously having served MAP since October 2007. The married father of two children enjoys golfing, hiking and kayaking.